Some call him Santa Claus, others Father Christmas but he’s in every child’s thoughts. Life is busy and children grow up fast. 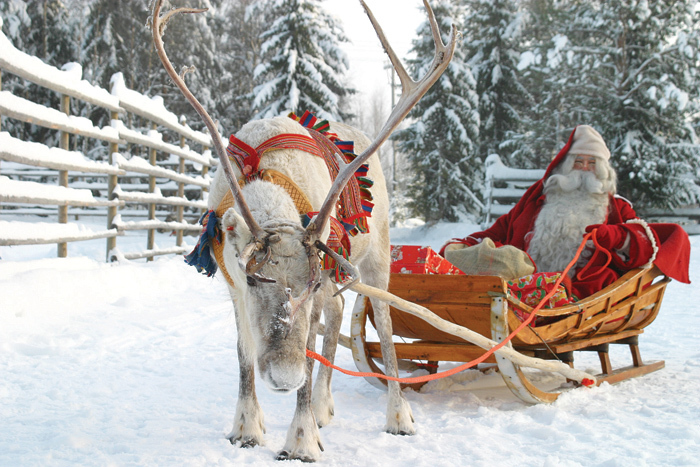 Visit Santa in his home in Finnish Lapland and you’ll all treasure the fairy-tale memories you make forever after. Some have a bucket list, others a wish list and they often include going to the Arctic. Book that holiday and you can tick it off! Visit magical Saariselkä (Europe’s northernmost holiday haven, some 250kms north of the Arctic Circle) and you’ll keep the whole family happy with the wide range of incredible experiences to enjoy. Some send Christmas cards, others festive emails – if you join us in Lapland your youngsters can also write letters to the real Santa! You send them by our Christmas Magic Mail before you leave. In Lapland Santa Claus reads them all personally, ready to chat about them on your private visit to meet him in his hideaway log cabin. Some dream of glimpsing Santa and his reindeer galloping across the sky, others want to gaze at the dancing Northern Lights – on this trip you may see both! Fly across the Arctic Circle direct to Lapland and,you’ll be greeted at Ivalo Airport by Santa’s reindeer and one of his mischievous elves. Take a photo or two before you head to Saariselkä - and keep an eye on that night sky for the Northern Lights! They appear in the Arctic and glow in a myriad of colours. Some imagine a romantic reindeer sleigh ride, swishing through a winter wonderland, while others dream of whooshing along, steering their own snowmobile. Even the children can experience the excitement of driving, with a mini snowmobile called a Skidoo. Some think of Lapland and beautiful Husky dogs, others the resident herds of reindeer, including Rudolph and his friends. Experience both! 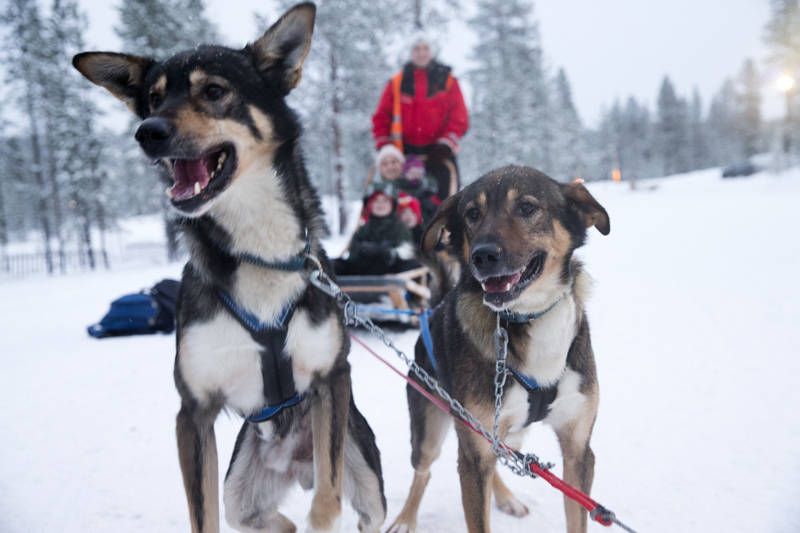 You can shout the traditional ‘mush mush!’ as you race along on a sled pulled by enthusiastic Huskies as part of your holiday experience. And then there’s the wonderful moment you and your children climb aboard a sleigh to gleefully glide along behind prancing, dashing reindeer. You can also feed the animals at the Reindeer Centre and play Crazy Reindeer Golf and Reindeer Lasso. Some like ice in their drinks – and others like ice outside their drinks - like at our Ice Bar, which is inside our Igloo Fantasia. You can warm up with a tasty tonic before joining in the fun, seeing the elves prepare presents for Santa’s sack, and marvelling at some exquisite ice sculptures. Some love Lapland’s snow sports, others love telling about it afterwards … try tobogganing, Ice Fishing, Snow Hockey, Kick-Sledding (a cross between a scooter and a toboggan), Snow Shoeing and maybe even skiing. Afterwards gather round a toasty fire to share stories about your adventures, or warm up in a fragrant Finnish sauna. Some picture walking in the fresh air amidst pine trees showered in fresh snow; others savour the thought of playing snowballs with the elves and sharing funny jokes. Some like a modern hotel, others a woodland log cabin – or something in between! On a Lapland Santa Claus trip you can choose exactly the right holiday haven for you and your party. All our dwellings in Saariselka are carefully chosen and vary in size and the facilities they offer. You might desire a swimming-pool with spa centre – or large windows from which to view the Northern Lights. Or a cosy Lapland Christmas Cabin, where you’ll be greeted by one of Santa’s helpers, with the kettle already on and a freshly baked cake waiting for you to help yourself. Lastly - but most importantly, everyone loves Santa! He is waiting for you to come and say hello and share your Christmas wishes with him … probably the best reason of all! You can do all of this and more. Choose your three-or-four-day adventure now – either Santa’s Magic or Santa’s Aurora trips, both with fantastic optional activities. Book early for extra discounts off children’s prices.